Home Get Inspired Luxury Hail Caesars! The exquisite Qua Baths & Spa at Ceasars Palace in Las Vegas. When cabana motel owner and craps enthusiast Jay Sarno opened Caesars Palace in 1966, his 680-room spectacle raised the bar among The Strip’s gaming getaways. The 34-acre Romanesque resort was hailed as the epitome of luxury and fantasy, with toga-clad cocktail servers, a mega-watt casino, a star-studded showroom, and grand driveway flanked by Italian Cypress and ornate fountains. Fast-forward to 2013, where the 85-acre Caesars empire continues its reign on Las Vegas Boulevard, burgeoning to 3,960 rooms in six towers. Toss in a sophisticated shopping emporium, epic entertainment venue, two dozen-plus dining options, 5-acre pool oasis and hedonistic spa, and the gilded Sin City icon perpetuates the lavish lifestyle oozing since day one. The spacious Octavious Tower deluxe king room. It’s a game plan that’s paying off in trumps. If your clients haven’t visited Caesars Palace Las Vegas lately, they’ll be dazzled by this renaissance with its flurry of indulgent bells and whistles. In February, the destination resort debuted the world’s first Nobu Hotel. A collaboration between Caesars and Nobu Hospitality, the 181-room boutique retreat is a Zen-inspired remake of the Centurion Tower that originally opened in 1970. In a similar “resort within a resort” genre, The Laurel Collection by Caesars Palace, a boutique hotel concept within the massive resort, has launched in the 949-room Augustus and 668-room Octavius towers. On a late-summer visit, we rolled up to The Laurel Collection’s private valet entrance and were escorted to an exclusive registration area where expedited check-in was void of typical casino clamor. What’s so pleasant about this posh enclave with its dedicated staff is how it immerses guests in escapism just steps from the hoopla. The elevated experience offers guests direct access to such upscale amenities as Qua Baths & Spa, Garden of the Gods pool enclave, Bacchanal Buffet and Restaurant Guy Savoy. The accolades have been gushing in, with Forbes Travel Guide awarding four stars to the accommodations and five stars to Savoy’s namesake eatery. We landed in a spacious Octavius Tower deluxe king room, where old guard Caesars has been twisted with contemporary touches. With splashes of color and a flashy view, your clients may be inclined to laze on the sofa and catch the Fountains of Bellagio show rather than snooze between casino runs. The furnishings are distinctively modern, with an accent chair, stone table, desk and bed wrapped in luscious Anichini linens. The marble-tiled bathroom ups the luxe ante with a double-sink vanity, enclosed glass shower, whirlpool tub for two and flat-screen TV. Tech-savvy travelers will also appreciate a MediaHub perk with plug-and-play capabilities for connecting and streaming directly from any mobile device to a 42-inch flat-screen. 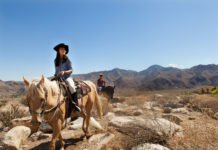 Nightly rates are from $180-$690, with suites ranging from $700–$5,000. The first phase of The LINQ will open by year’s end. High-brow guests of The Laurel Collection will swoon over Caesars’ gastronomic jackpot. Here, a celebrity-helmed roster includes outposts by Gordon Ramsey, Bobby Flay, Michel Richard, Nobu Matsuhisa and Guy Savoy (recommend that your clients make reservations early for these haute spots). Newest among the trove, the 327-seat Nobu Restaurant and Lounge manages a surprising sense of intimacy despite its massive 12,775-sq.-ft. scope. Showcasing the chef’s fusion of traditional Japanese and Peruvian cooking, the eatery breaks up seating schemes via a sushi bar, dining pods, lounge and trio of teppanyaki tables touted as a U.S. first for Nobu. Our entourage opted for the latter, where our culinary wizard performed a fiery slice, dice and sizzle show with Chilean sea bass, Maine lobster, foie gras and crab fried rice. We also traveled a mega epicurean path at the Krug Chef’s Table secluded within two-Michelin-starred Restaurant Guy Savoy. The acclaimed French chef has curated a savory affair that pairs up to 13 tasting courses with Krug’s prestigious Cuvee Champagnes. Caesars chalks up yet another first, as this is the sole Krug Chef’s Table in the U.S. Separated from the gleaming kitchen by a floor-to-ceiling glass wall, the table becomes an evolving culinary stage for line-caught French sea bass, pan-seared quail, and artichoke and black truffle soup. Rolling the dice to create a smorgasbord feast that redefines the term, Caesars gutted its former Cafe Lago Buffet space and launched the chic gourmet-style Bacchanal Buffet. While brunch diehards heap on staples like shrimp, crab legs and prime rib, your clients should visually graze before culling from nine themed show kitchens. Dishes like crepes, Chinese soups and omelets are made to order, while international and regional comfort foods are served on small plates or from skillets instead of traditional chafers. Adding icing to the cake is how patrons can chat with master chefs as they work their magic. Belting out her mind-blowing five-octave range, The Colosseum’s resident crooner melds her greatest hits with tributes to other celebrated artists. Featuring a 31-stong full orchestra and band, the production confirms why the five-time Grammy winner consistently packs the house. When Celine is resting her pipes, other headliners include Jerry Seinfeld, Rod Stewart, Shania Twain and Elton John. With eight themed pools named after Roman gods, this palatial watering hole is a “see and be seen” paradise. Tip the scale by reserving a plush cabana decked out with comfy chairs, flat-screen TV, stocked mini-refrigerator, ceiling fan, and food and libations service. Roman baths and an Arctic room make this blissful refuge a chill zone from the gambling frenzy. For ultimate nirvana, the 90-minute Nagomi Ritual pampers with a floral foot bath, massage blending Thai, Balinese and Shiatsu movements, and finale carboxitherapy facial. Up the oomph with a blow-out styling and artisan makeup session at Color Salon by Michael Boychuck. Lavish Romanesque architecture and painted skies reflecting the change from sunrise to sunset make this retail and dining mecca a sure bet. After spending sprees at Versace, Armani, Ferragamo, Fendi, Gucci and Valentino, shoppers can refuel at New York-rooted Carmine’s, P.J. Parke’s, Spago and Sushi Roku. PURE envelops night owls with four distinct experiences amid two levels of excess. Ride upstairs in the German-imported glass elevator or ascend the club’s dramatic twisting staircase to an esoteric terrace that rocks with house music and vibrant Strip scenery. Your luxury-lusting clients will likely chime in that in Vegas, there’s no place like Rome. Las Vegas’ McCarran International Airport (LAS) welcomes nonstop and connecting service on more than 30 airlines from 145 global destinations. Rental cars, taxis, shuttles and private limousines are available for transportation to The Strip. 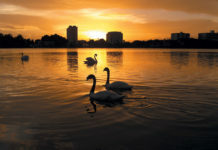 Despite its mother lode of amusements, The Strip has been jonesing for an open-air entertainment, retail and dining district. 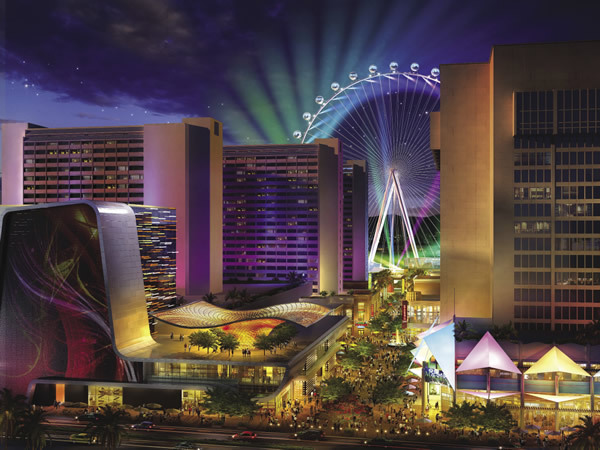 As it rolls out in phases over the next year, Caesars Entertainment’s The LINQ will deliver the goods in a walker-friendly urban neighborhood complete with the 550-ft. High Roller. Those void of vertigo can climb into one of 28 glass-enclosed, air-conditioned cabins for a 30-minute aerial sightseeing spin on the world’s tallest observation wheel. Akin to a casino, The LINQ will perk around the clock. “We’re creating an experience that currently doesn’t exist within the market,” says Gray. Plans call for the first phase to ignite by New Year’s Eve.